↑ Thomas D. Grant. Stormtroopers and Crisis in the Nazi Movement: Activism, Ideology and Dissolution. London, England, UK; New York, New York, USA: Routledge, 2004. pp. 30–34, 44. ↑ Michael Wildt (15 July 2012). 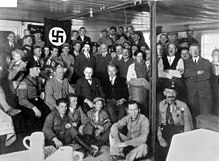 Hitler's Volksgemeinschaft and the Dynamics of Racial Exclusion: Violence Against Jews in Provincial Germany, 1919 1939. Berghahn Books. pp. 96–97. ISBN 978-0-85745-322-8.